June 12, 2005 – ECW One Night Stand: Rey Mysterio beat Pyschosis (without the mask) – Rey was booed heavily for doing the 619! ~~~On the same Pay Per View: Super Crazy defeated Tajiri and Little Guido in an International Three Way Dance! ~~~Super Crazy stole the show with a “super crazy moonsault” off the balcony onto all the members of the FBI..
June 13, 2005 – RAW: Super Crazy and Psicosis defeated Texas and Tennessee in a dark match..
June 16, 2005 – Velocity: Super Crazy and Psicosis defeated Akio and Billy Kidman | Juventud Guerrera defeated Sho Funaki..
June 23, 2005 – SD! : Paul London vs. Chavo Guerrero was interrupted by the debut of Mexicool (Juventud/Psicosis/Super Crazy)..
June 30, 2005 – SD! : Paul London vs Chavo Guerrero was again interrupted by the Mexicools (Juventud/Psicosis/Super Crazy)..
July 7, 2005 – SD! : Matt Morgan vs. William Regal was interrupted by The Mexicools (Juventud/Psicosis/Super Crazy)..
July 28, 2005 – Smackdown! : The Mexicools were mistaken for “concession” workers so they had fun and gave all the food to fans..
August 11, 2005 – Smackdown! : The Mexicools (Super Crazy/Psicosis) beat William Regal and Scotty 2 Hotty when Regal walked out! August 18, 2005 – Smackdown! : Christian tried to interview “himself” on the Peep Show but the Mexicools destroyed the set! August 25, 2005 – Smackdown! : Christian had Booker T & Sharmell on the Peep Show only to have the Mexicools ruin the segment..
~~~Later on: The Mexicools (Psicosis and Super Crazy w/Juventud) defeated Booker T and Christian when Christian walked out! September 9, 2005 – Smackdown! : The Mexicools (Super Crazy and Psicosis) defeated Nunzio and Big Vito in a match taped for Velocity..
September 23, 2005 – Smackdown! : The Mexicools (Psicosis and Super Crazy) defeated Nunzio and Big Vito in a match taped for Velocity..
October 14, 2005 – Smackdown! : MNM & William Regal & Paul Burchill beat The Legion of Doom & Psicosis & SuperCrazy..
November 4, 2005 – Smackdown! : The Mexicools (Psicosis and Super Crazy) defeated Paul Burchill and William Regal..
November 11, 2005 – Smackdown! : MNM attacked some model named Michelle Deighton until The Mexicools made the save! December 2, 2005 – Smackdown! : The Mexicools (Super Crazy and Psicosis) won a #1 Contenders Tag Team Battle Royal! December 9, 2005 – Smackdown! : Super Crazy w/Juventud and Psicosis defeated Joey Mercury w/Melina and Nitro..
~~~After the match, Kid Kash came out of nowhere and attacked Cruiserweight Champion Juventud Guerrera! December 18, 2005 – Armageddon: MNM (Mercury and Nitro w/Melina) defeated The Mexicools (Psicosis and Super Crazy)..
~~~Later that night: Kid Kash defeated Juventud Guerrero to capture the WWE Cruiserwight title! December 30, 2005 – Smackdown! : The Mexicools (Super Crazy and Psicosis) defeated The Dicks (James and Chad)..
January 6, 2006 – Smackdown! : The Mexicools (Psicosis and Super Crazy) defeated Nunzio and Big Vito on VELOCITY..
January 13, 2006 – Smackdown! : The Mexicools (Psicosis and Super Crazy) defeated The Dicks (James and Chad) on VELOCITY..
January 20, 2006 – Smackdown! 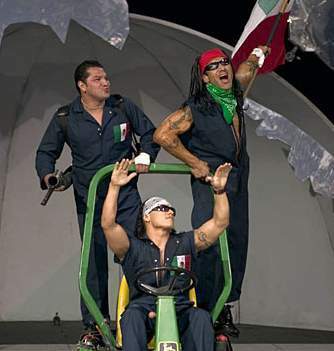 : The Mexicools (Psicosis and Super Crazy) defeated Nunzio and Big Vito on VELOCITY..
January 21, 2006–WWE Live Event: The Mexicools participated in a special “Tribute to Eddie Guerrero” show in Monterrey, Mexico..
February 3, 2006 – Smackdown! : MNM w/Melina Perez defeated The Mexicools (Psicosis and Super Crazy) to retain the Tag Team titles..
March 17, 2006 – SmackDown! : Gymini (Mike and Todd Shane) defeated The Mexicools (Super Crazy and Psicosis) (Velocity)..
March 31, 2006 – SmackDown! : The Mexicools (Psicosis and Super Crazy) defeated Kid Kash and Jamie Noble..
April 14, 2006 – SmackDown! : The Gymini (Jesse and Jake) defeated The Mexicools (Psicosis and Super Crazy)..
June 2, 2006 – SmackDown! : Psicosis and Super Crazy defeated Paul London and Brian Kendrick in a non-title match taped for Velocity. ~~~After the match, The Greak Khali showed up and attacked Kendrick, London & Crazy but Psicosis ran like a coward..
June 16, 2006 – SmackDown! : The Greak Khali w/Daivari defeated The Mexicools (Psicosis abandoned Super Crazy again)..
June 23, 2006 – SmackDown! : Brian Kendrick and Paul London defeated The Mexicools to retain the WWE Tag Team titles..
~~~Super Crazy had a streak of offense but Psicosis tagged himself in then screwed up and got himself pinned to lose..
June 30, 2006 – SmackDown! : Gregory Helms vs. Super Crazy ended in a no contest when Psicosis attacked Super Crazy! October 31, 2002–UWE/LEGEND: The Mexicools (Juventud Guerrera, Psicosis and Super Crazy) defeated The Mexican Powers (Extreme Tiger, Joe Lider and Ultimo Gladiador). April 22, 2018–Blitzkrieg Pro: The Mexicools (Juventud Guerrera and Super Crazy) defeated Massage NV (Dorian Graves and VSK).